I was recently provided with a complimentary copy and had the good fortunate to review the entire system, which includes an E-book and exercise DVD. Although Dr. Mullen provides an extensive library of exercises, but this product is about more than the exercises themselves. Dr. Mullen offers a system to bridge the gaps between prevention, rehab, high performance dryland, and of course swimming. Plenty of swimmers dutifully perform dryland exercises, yet still get hurt. Once “fixed”, they often struggle to make the transition back to normal swimming. The importance of bridging these gaps becomes clear in the opening seminar where Dr. Mullen discusses links between biomechanics and muscle length, strength, and timing. Having spent millions of yards staring at the black line himself, Dr. Mullen understands the importance of keeping the swimmer in the water. Despite their best intentions, many coaches, swimmers, parents, and medical professionals fail to effectively coordinate their efforts. 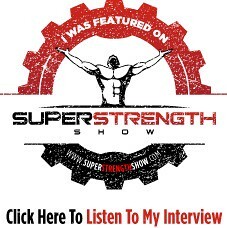 His experience as a rehab professional, strength coach, and elite swimmer shines through with this fully integrative system. If you read Swimming Science and Dr. Mullen's articles at Swimming World you’ll get a flavor of what the system offers. One weakness of many approaches to the shoulder is they fail to safely integrate the shoulder with full body movements. This system guides the swimmer from tennis ball massages all the way though weighted pull ups and pushups. A benefit of this system is that it’s compatible with different forms of training, both in and out of the water. With this system you’ll understand why optimal function and health of the shoulder often involves improving areas away from the shoulder joint itself! 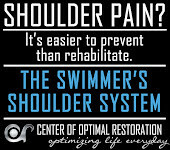 This product is equally valuable for the swimmer, coach, parent, and even the rehab professional. Coaches and parents are the first responders to discomfort, yet are often forced to wade through a confusing morass of conflicting information. Athletes often shun the medical system or wait until it is too late because they’ve experienced medical professionals who kick them out of the pool at the first sign of pain. However, the rehab professional can learn the “lingo” of swimming to improve interactions with coaches and swimmers. Teamwork between these entities via a common value system is paramount. Even if you did not watch a single exercise from the DVD, the opening seminar itself can justify the value of the product. At the conclusion of the E-book, Dr. Mullen provides schedule templates broken down by phases with progressions based on the exercises provided. Every exercise is described in the E-book and demonstrated on the DVD. You can find exercises on the DVD grouped according to their respective phases in the system. The system is accompanied with bonus material: dryland specialist Tad Sayce (coach of open water Olympian Alex Mayer) provides guidance on what common exercises to avoid. Some of these may surprise you, but Tad offers detailed explanations on why certain exercises are not safe choices for the shoulder. Even the best shoulder prevention system is useless if you later mix exercises with unnecessary risk! Dr. Mullen also offers a guide for taping. Realistically, swimmers can’t head to the doc’s office before every practice to get taped, so a working understanding of taping fundamentals can help ease the transition from painful to pain free swimming. But remember…don’t become a tape addict! This product is a much needed addition to the swimming community. Although shoulder injuries are less common in triathlon, the principles can also aid multisport athletes. Swimming is a unique culture that has been ahead of the curve in many areas, but has often insulated itself from best-practices in rehabilitation and dryland conditioning. Thankfully Dr. Mullen speaks “swimmer” and has created system that serves the needs of this unique population. Dr. Mullen takes a much needed step to bridge this gap to improve the health and performance of swimmers at all levels.